A self-build project isn’t for everyone. Sometimes the property you need is right under your feet, but it just needs some improvements. 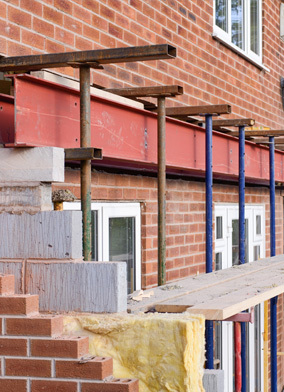 So if you’re embarking on a renovation, extension or conversion project to an existing property, you’ll want to ensure your project is protected. Your existing household insurer may not provide cover for the work, materials or liability exposures involved. That’s why we offer our own Renovation and Conversion insurance designed especially to protect you and your property as you work to expand its potential. You’re involved in the project, employing workers, buying materials etc. Why do I need Renovation & Conversion insurance? Whether you’re planning to renovate, convert or extend an existing property, there are numerous risks that could put your project in jeopardy. Your existing home insurance provider may not be able to cover the project, perhaps due to the value of the renovation/ extension project or the extent of the work. We can provide cover from 3 months onwards and all policies, no matter the duration of cover, include the new works, materials on site, Public Liability insurance and Employers' Liability insurance as well as items of plant. Employers’ Liability is a legal requirement if you employ people to work on site. View our Policy Summary to find out more. Our Renovation & Conversion policy is designed to cover you from the moment building work starts up until the work is complete. Personal Accident and Legal Expenses can be added to your policy for extra peace of mind. Personal Accident insurance is designed to pay a lump sum of money if an insured individual is killed or suffers a defined permanent physical disability (e.g. loss of a limb, or loss of sight) while on the self-build site. Legal Expenses cover is designed to cover up to £50k of legal costs arising from contractual disputes between you and your contractor, utility companies, or the removal of squatters from site during the insured period. We’ve worked closely with Zurich, a major global insurer, to offer a unique policy that aimed at meeting the requirement of your project and provide the security you need.